To be able to use a mobile cellphone is nowadays considered to be crucial by billions of people. (Never mind the toxic waste and electric power demand.) And the device is not limited to telephone calls: people may mostly use screens online to access Facebook, Google, WhatsApp, et al, which hooks more people into the system. Many reach the point of having to simply be online always, or almost always. As a new goal for human interaction, one must always stay in touch or be on call. To go in the opposite direction risks exclusion and derision. So privacy is sacrificed and attacked. Meanwhile, the technological and consumer allure for modern humanity is reflected in the fact that almost two billion people have a Facebook account. The simple alternative to being "connected" is scary for many. It is almost a Zen novelty stunt to go offline for a whole weekend. One celebrity family was recently featured in the news for going on mobile-phone and computer-internet "fasts." Opting in means paying for the service, and working in order to be able to afford it. What other costs are there for mass reliance on the basically out-of-control telecommunications industry? Brain tumors? Crashes when driving while operating a mobile? Literacy was formerly an arguably nice development and pastime, a key to both learning and dominating -- but not crucial as a daily lifestyle. People always got together to simply speak and deal with any matters for decision at hand, whether among hunter-gatherers or citified folk attending a town hall meeting. This has sinister implications beyond snooping and surreptitiously targeting people to obtain information valuable for marketing or other purposes. A thrilling novel about the trend to share personal information publicly and be transparent to the utmost is The Circle by Dave Eggers. During the story one wonders just how out of control the behemoth social media corporations can get with everyone's complicity. It is interesting to wonder just how much society and human rights can be quickly impacted by technology and managerial control systems. Casting Silicon Valley as a nightmare that has just begun makes for a spine-tingling story, aided by The Circle's thorough character development. Understandably, today one feels a need to do anything necessary to maintain communication with family members, and, just as commonly, to pursue employment or enjoyment. These are easy reasons to go along with the popular trends of techno usage that are afflicting or even aiding the planet. The overall telecommunications system requires an electronic and industrial infrastructure that inflicts ecological and social harm on a huge and mounting scale. One can claim the system is instead benign, but it still will not be able to last many years: besides involving huge amounts of electric power, it must rely on nonrenewable, dwindling resources to maintain or grow the infrastructure's customer base. The question of when this house of electronic cards may collapse (and how thoroughly) is an economic-science discipline in itself, and attracts diverse adherents, including survivalist-preppers. Whether Jane Consumer “loves” her iPhone, or Joe Sixpack refuses to get an iPolluter while using cheaper and less sophisticated equipment, the predominant view is of alleged, universal necessity coupled with the wonderfulness of cellphoning at will and surfing the Internet instantly. One is socially and even governmentally forced to participate. The tendency to join up and jump on the online bandwagon may be due to occasional pressure to be able to supply a cellphone number to an airplane fare’s purchase online. Bank transfers, ATM use, bill-paying and more tend to swell the ranks of the connected who are in the loop. Meanwhile, if a segment of the population is ignored or excluded, these people are often considered precariously out of it and are way off to the side in the public arena. Fringed, marginalized. Missing out on such fun as Wikileaks and starlets' wardrobe malfunctions. Or picture the UN climate meeting now starting in Marrakech: it would be unheard of for any of the thousands there, other than a burger flipper, to be without a cellphone as well as a laptop or iPad. If one is not tied in, so that being part of the world is possible, there are negative consequences. If one isn't part of the loose group-think of a set of Facebook Friends, while one is also unable to look up anything anytime on Google, and relying only on a landline telephone, a radio, a television, and using the postal service, one is viewed or made to feel like “a loser” or an elderly senior. Or, like a helpless child in an authoritarian world. Aren’t the non-wifi and non-cellphone means of communication and entertainment enough of an “on” state for consumers already? If they had been asked 25 years ago, their answer would have often been "Yes." Fortunately, there is still restorative leisure and educational activity available for almost anyone anywhere. For children, instead of phones they need more nature walks, drawing pictures on paper, playing physical games, etc., rather than burn electricity and charge up the toxic batteries. The old pre-Internet rat race was not enough of a yoke around many a worker's neck. Always the next corporate step had to be taken in a competitive race, for the sake of profitable business and connectiveness. The telecommunications industry’s involvement in high level politics and a changing infrastructure in favor of dominant corporate trends have assured since the 1990s a seemingly hard-wired wireless network. Interestingly, the enthusiasm for this industry and this kind of consumer behavior stands in opposition to not only the concerns of environmental and health impacts, but the longevity of the industry itself when it relies on very limited rare earth minerals and a host of other technological and resource issues. Meanwhile, as those issues are hardly on the radar of the consumers of online products, even affluent users of high tech communications are in a state of constant switching and adjusting only from online to offline and vice versa. The latter means being unconnected (my my!). So whether one is a teenage dropout of high school, or a well-off corporate executive, the only times that exist anymore for a person are when he or she is online or is offline. There is no other status anymore, almost. Increasingly, modern consumers' loneliness and isolation have fed into more demand for "social" media whereby strangers are actually confused as real and, sometimes, one's only "Friends." Using the common “Airplane Mode” as an offline switch is to be still connected to the data and certain “apps" used by the hand-held device. An advantage of Airplane Mode is that the radiation waves — used to connect the devices to other devices and the entire Internet — are stopped until the switch is thrown again. After all, some users have reported physical problems from wifi, cellphones, and cordless phones, so various governmental bodies have taken action to protect the public (despite deep-pocket opposition from the telecommunications industry). When the city of San Francisco, California passed an ordinance requiring a hand-held device’s radiated heat signature be displayed on packaging for consumer products, the telecommunications industry’s top echelon retaliated by publicly scorning the city as the site of the next cross-corporate meeting of the telecommunications industry that had been announced as in San Francisco. Why the reason to hide information from the public? Answer: a can of worms comes to light. Similarly, elsewhere in control-obsessed industries, we see GMO labelling fought by the industry, and Big Pharma calls a lot of shots. Yet, how smart was San Francisco when it established a goal a decade ago to make every spot in the city an internet (radiation, surveillance, Liking a cute kitten-post) zone? Were cell(block) phone towers and ubiquitous "smart phones" not enough? No, everywhere wifi -- despite the German government's establishing ten years ago that wifi is a public health hazard, especially for children. In this era of upholding professed mass rights — whether the The Universal Declaration of Human Rights or some similar body of thinking to follow — the rights of the offline and the unconnected have to be respected too. And, any social or financial advantages accrued by the online and “connected” folk, often at the expense of the unconnected who do pay taxes and buy consumer goods in the corporate economy, must be reflected in supportive policies for the unconnected as a way to level the playing field and compensate the unrewarded unconnected. The existing positive consequences of being an offline person are insufficient, as they aren't promoted by the corporate media nor discussed at the bar -- because who can compete with the Chicago Cubs? Treating the phenomenon of unconnectivity and non-participation as a disease or deprivation is an unfair and unsustainable “solution” for social problems, as if it were as critical as an appalling lack of literacy. (Although, humanity's prior, long record of sustainability featured no literacy.) Trying to make every square inch of the planet a wifi zone may make the assertive technophiles -- often in the progressive column politically -- feel good and useful, but the fact remains: there will always be unconnected and disconnected people who may be very good writers on paper or great speakers before a crowd. Let us never neglect the Unrewarded and Unconnected. The UandU, if formed, could become a major public interest group. It could also encourage simple living and a more relaxed lifestyle on a much wider scale than pursued today. Indeed, many simple-living practitioners are reluctantly having to support the telecommunications industry with their personal purchases, while preferring not to have around them the cellphone towers, the grid, and the extra roads for that matter. A corollary is that many more people might feel incentivized to lead a more natural lifestyle that offers a kinder, gentler pace, if being offline and unconnected were a bit more respected and facilitated. It would mean less consumption individually and in the aggregate, and more availability in person for loved ones and members of one's community. Diversity is taking a hit when the "value" of often being online and supporting the telecommunications industry and its advertising partners are "the only game in town." Minorities have always had to make demands for their own self-preservation. Maybe it comes down to this ethic and philosophy: live fast, or live better — one can’t have both. 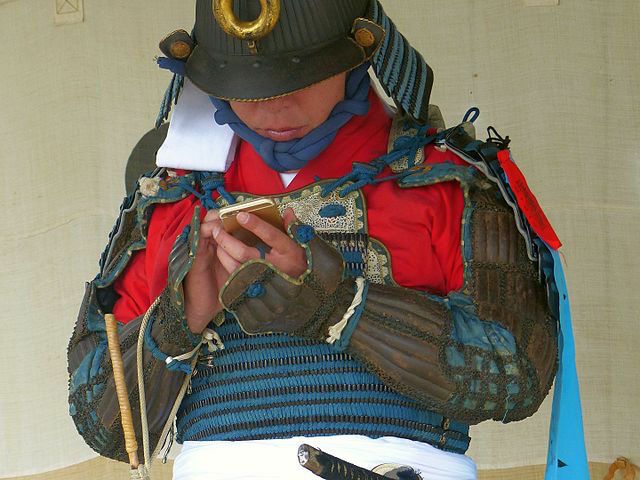 Japanese man in Medieval dress - via Wikipedia Commons. Thanks to Resilience.org for finding this picture for their publishing of above article. I don't see much joy in the faces of users of these convivial tools, and we know that 10 years of using cell phones can produce gliomas of the brain because the EMFs easily pass through the ear canal into the cerebral cortex. The Digital Age is really about unhappiness, ill health, and corporatized sociality, not to mention unprecedented wealth for those at the top of the food chain. ..., Right on target Peter. I have encouraged people to get back to vocal cords and start communicating in the flesh; see each other, hear each other, feel each other. No one seems to be interested! It's almost as if we are as individuals intentionally alienating ourselves from each other. The authorities, I'm sure are pleased with this. We are doing the work for the authorities.